Chris Anderson has been a nature photographer since the early 1980's. Concentrating on what he refers to as "backyard nature photography", most of his subjects were only a short hike or drive from his door. His interest in photography actually began in the late 1970's when he developed a passion for astro imaging. Today, Chris maintains Darklight Observatory, dedicated to digital imagery of the Cosmos. Chris worked for Schuhmann's Click Clinic and Murphy's Camera of Louisville for six years before changing careers and going to work as a Trooper for the Kentucky State Police. His academic background includes a Bachelor of Science degree in Police Administration and certification as an Advanced Fatal Traffic Collision Reconstructionist. 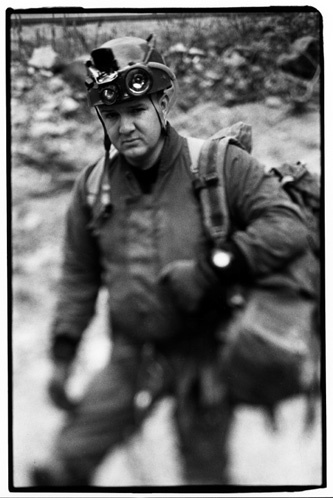 Although Chris has not actively pursued professional photography, his work has been published in the Commonwealth of Kentucky's Land, Air, and Water, Earth Magazine, Sky and Telescope magazine, National Geographic Adventure, numerous newspapers, and in several text books and educational CD ROM's. He also actively speaks to public organizations about caves and nature photography, such as the Sierra Club and various historical societies. Chris now resides in Western Kentucky where he lives with his wife, Teresa, their son Sagan, and two dogs BB and Autumn.